No matter where you go these days you can see signs of the great success the LEGO® Systems Group are enjoying these days. It seems like the world has gone brick crazy. The LEGO® company clearly has the formula right, engaging their community of users in the development of groups and creating new products, competitions, exhibitions, movies, theme parks, games, and clothing. And that doesn’t even include their main product—the actual bricks. In 2000, the company was not doing quite as well. Numerous case studies examine why they were losing money, but among the reasons were: a trend where parents were buying their children electronic toys, not bricks; LEGO’s internal brand confusion; too many focus areas; and they had not yet created the amazing Mindstorm Robotics toys (which later won toy of the year) or the extensive list of licensed products. So what did they do to turn things around? They remembered their core business. They stopped allowing the market to drive their decisions and they got back to their values, which is and always has been to create a toy that improves the lives of children. The word LEGO® actually means Play Well. Their slogan, since 1932, is “Only the best is good enough.” This continues to hold fast in changing times. Their brick sets help children to not only develop special reasoning but the amazing city sets help them to learn more about the world in which they live. Most people reading this blog know that we also use bricks in our consulting work. 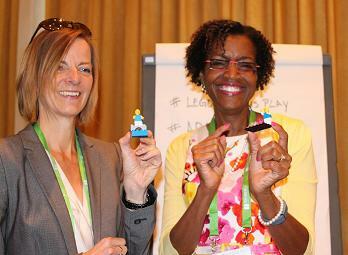 LEGO® SERIOUS PLAY® when facilitated with adults helps people clarify inner thoughts, communicate better stories, and envision a better future. The imagination that these bricks facilitate continues to amaze us each and every time we use them. In retrospect, leading minds at The LEGO® Group, with their head office in Billund, Denmark, may say they made a lot of mistakes along the way, but no one can deny the success and fantastic work they are doing now. And close to my heart is the LEGO® Foundation, which has a voice on the world stage and is working tirelessly in the movement of education reform. In reflection, everything the LEGO® Group did taught them a valuable lesson that helped to shape where they are right now. 1. Get your stakeholders or customers involved, turning them into fans and partners. 2. Always remember your core values, purpose, and brand promise. 3. Grow your business strategically. “Yes” and “no” decisions are equally important. 4. Continue to innovate and think creatively within a big vision for a better future. 5. Play with ideas, your imagination is your only limitation. If you have additional lessons that you have noticed from watching the LEGO® Group send us a note we would love to hear them and add them to the list!